I made a game! It has three buttons, and five lights! Look! It used to have only two colors of lights (red and green), but the game was too easy. So now there are three colors of lights (red and green and the new yellow! ), and it is not as much too easy! Each button is connected randomly to two or three of the lights. When you push a button, it changes the colors of all the lights that it is connected to; if the light was red it turns yellow, if it was yellow it turns green, if it was green it turns (wait for it!) red. 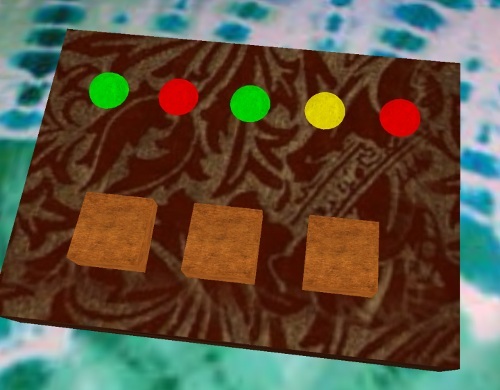 If you get all the lights to be green (and the lights are started out in a pattern that ensures that it’s possible), the game makes an appealing noise, lets you admire the green lights for a couple of seconds, and then rewires all the buttons to new random lights, and scrambles the colors of the lights to start a new game. Isn’t that incredible? :) Copies of the game are available from the author upon request! Many thanks to beta-tester Michele!